PORAC and the advocates at Aaron Read & Associates (ARA) have lobbied against AB 931 with a diligence that reflects the seriousness of this bill. AB 931 will result in more deaths of officers and the public. If passed, this bill puts everyone at an increased risk of crime. AB 931 limits the use of deadly force by a peace officer to situations where it is “necessary” to prevent imminent and serious bodily injury or death to the officer or to a third party. It would prohibit the use of deadly force by a peace officer in a situation where an individual poses a risk only to himself or herself. AB 931 would also limit the use of deadly force by a peace officer against a person fleeing from arrest or imprisonment to only those situations in which the officer has probable cause to believe that the person has committed or intends to commit, a felony involving serious bodily injury or death, and there is an imminent risk of serious bodily injury or death to the officer or to another person if the subject is not immediately apprehended. At the time of this writing, the Senate had removed AB 931 from the Senate Appropriations Committee and referred it to the Senate Rules Committee. This allowed the Senate more time to consider suggested amendments or other options. This also allowed all parties to “negotiate.” However, PORAC has been very clear that as long as the bill changed the standard from “reasonable” to “necessary,” we have to protect the officer and public. If that was removed, other issues could be considered relating to training and policy changes. If the Senate or the sponsors of the bill had wished to negotiate on amendments at this point, then those negotiations would have had to occur by the week of August 20. In addition, all amendments needed to be in print and to the Assembly floor by August 28. If no action was taken on the bill, and it remained with the Senate Rules Committee past the 28th, without rule waivers by the full Senate, AB 931 would stay with the committee for the year. 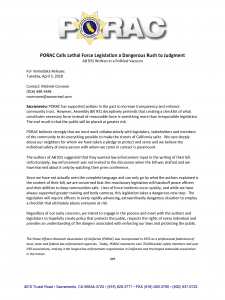 We understand that this report is outdated by the time it reaches your hands, but we hope it provides a glimpse into the legislative process and what PORAC handles on a daily basis. Oftentimes, like this, we are faced with an uncertain future. AB 931 was brought to our attention via rumors in the halls of the Capitol. That same day, a news conference was held by Assembly Member Kevin McCarty and Assembly Member Shirley Weber to introduce the bill’s language. From that moment on, PORAC’s leaders and panel attorneys, along with ARA, held many meetings to develop a strategy on how best to defeat this bill. Law enforcement across the board agrees that AB 931, in its current form, is detrimental to law enforcement. Our hope is that as you’re reading this, the bill is no longer an issue. However, it’s important to understand that this battle is not going away anytime soon. During the past few years, we have seen legislation asking for transparency in officers’ personnel files, attacks on our pensions and now bills attempting to criminalize our officers for doing their job. PORAC and ARA continue to work hard to fight for you — our members — and provide safety and security for your families. We look forward to continuing this journey with you. AB 284 (McCarty, D-Sacramento): This bill inserts the California Department of Justice (DOJ) into the process of studying peace officer–involved shootings (OIS) resulting in a serious injury or death. AB 284 requires the attorney general to do a two-year study of past officer-involved shootings resulting in serious injury or death to determine whether there is a need for change in shooting policy and to make recommendations. The study would look at shootings from January 1, 2015, to December 31, 2016. PORAC played an active role in opposing this bill from the beginning. One of our arguments was that we didn’t believe legislation was needed for this issue. Under current law, the attorney general can already go in on an investigation. For this reason, Assembly Member McCarty made the decision to turn his bill into a budget augmentation of $10 million. We met with the Senate budget staff to continue our efforts to stop the request from being funded. We were recently informed that the Senate denied the McCarty budget proposal. As of right now, the funding for the DOJ OIS Investigation program is dead. AB 748 (Ting, D-San Francisco): This bill requires the release of body-camera footage within 120 days, regardless of whether there is still an active, ongoing investigation, disallowing the use of redaction technology to obscure specific portions of the recording for law enforcement purposes and prohibiting the use of biometric technology on the video. 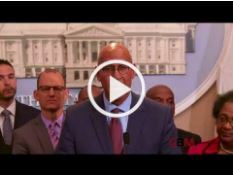 At the time this article was written, we had just been handed amendments to AB 748 that purport to align with LAPD’s new video release policies. The amendments attempt to remove the negative impact this bill could have on ongoing investigations by allowing for extensions. PORAC’s lawyers are analyzing the amendments, and we will follow up when we have more information. AB 748 is currently awaiting a hearing in the Senate Judiciary Committee. AB 931 (Weber, D-San Diego): This bill would limit the use of deadly force by a peace officer to situations where it is “necessary” to prevent imminent and serious bodily injury or death to the officer or to a third party. It would prohibit the use of deadly force by a peace officer in a situation where an individual poses a risk only to themselves. AB 931 would also limit the use of deadly force by a peace officer against a person fleeing from arrest or imprisonment to only those situations in which the officer has probable cause to believe that the person has committed, or intends to commit, a felony involving serious bodily injury or death, and there is an imminent risk of serious bodily injury or death to the officer or to another person if the subject is not immediately apprehended. Amendments are being proposed; however, as of this writing, they are not yet in print. PORAC’s leaders and panel attorneys, along with ARA, have been in many meetings over the last couple of months to develop a strategy on how best to defeat this bill. AB 931, in its current form, is detrimental to law enforcement and puts officers and the public at risk. This is our number one issue this year, and every effort is being put forth to keep the bill from moving forward. We will keep you informed as the situation progresses. SB 1421 (Skinner, D-Berkeley): This bill permits inspection of specified peace officer and custodial officer records pursuant to the California Public Records Act (CPRA). SB 1421 provides that records related to reports, investigations or findings may be subject to disclosure if they involve the following: incidents involving the discharge of a firearm or electronic control weapons by an officer, incidents involving strikes of impact weapons or projectiles to the head or neck area, incidents of deadly force or serious bodily injury by an officer, incidents of sustained sexual assault by an officer or incidents relating to sustained findings of dishonesty by a peace officer. PORAC has met with Senator Skinner, her staff and the bill’s sponsors on many occasions and are working with her office on potential amendments. Stay tuned for more information. In the meantime, PORAC remains opposed. As you know, the June 5 primary election is behind us. Incumbent legislators in both houses who were up for re-election advanced to the general election, which will be held on November 6.